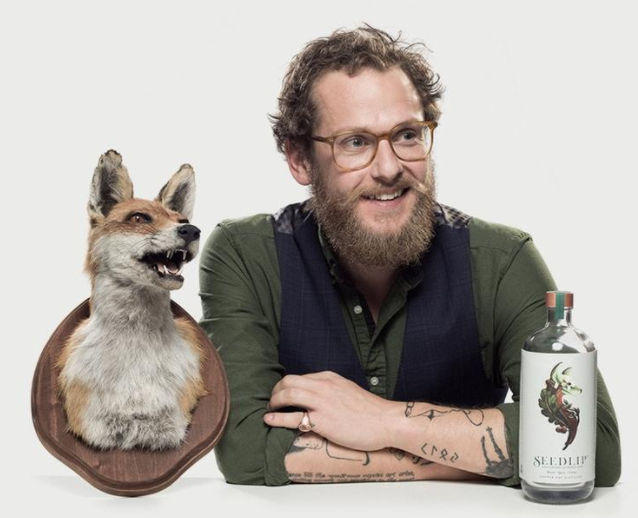 When I first heard about Seedlip, the world’s first distilled non-alcoholic spirit, I was skeptical. Though I mainly drink to experience the joy of a perfectly crafted cocktail or straight spirit, I’d be lying if I claimed the alcohol buzz wasn’t a big part of why I imbibe. But as a liquor journalist and enthusiast, it’s my duty to try the best, worst and weirdest spirits so that I can ensure that you, dear reader, are drinking the best stuff that’s out there. So when I was invited to experience Seedlip, I put aside my reservations and gladly accepted. Seedlip may be non-alcoholic, but the distillation process is similar to that of traditional spirits. It goes through the same maceration, distillation, filtration and blending—the only difference between Seedlip and most spirits is that it does not go through fermentation. The six-week process begins with fresh produce, like English peas, hay and a variety of herbs, sourced from Branson’s family farm in northern England. The distiller individually macerates each plant in a neutral grain spirit and water before distilling the mashes in copper pot stills. They remove the alcohol, collect the remaining, concentrated distillates, blend them together, then filter and bottle the final product. Just as you can’t rely on one spirit to make every type of cocktail, you can’t use just one type of Seedlip for every mocktail. So Branson developed two versions: Garden 108 (which is earthy and bright, not unlike gin) and Spice 94 (a warm and toasty version that’s still reminiscent of gin but can work like a whiskey when paired with the right ingredients). “I wanted to create something unique and memorable that paired perfectly with tonic or soda, and provided a base ingredient to build non-alcoholic drinks in classic cocktail styles that are familiar to people (think Martinis and Sours, for example),” he said. On its own, Seedlip Garden has a light, herbal flavor with notes of green pea, hay, hops, spearmint, rosemary and thyme, while Spice is aromatic and warm with allspice, oak, cascarilla bark, grapefruit and lemon peel. While it’s perfectly fine to sip solo, Seedlip’s flavors are quite concentrated, so it really shines when mixed into a cocktail. One drink I tried was a delightfully refreshing mix of Seedlip Garden, fermented Meyer lemon and Stone Barns honey, which paired perfectly with nibbles of fresh veggies. Another, made with Seedlip Spice, cherry shrub, cocoa nibs and pink peppercorns, worked wonderfully with pork, not unlike a glass of juicy red wine or Manhattan. The industry reaction to Seedlip has been positive since it hit the market in 2015. It’s currently served in more than 500 restaurants, hotels and bars across the world, including top cocktail dens like The Dead Rabbit in New York and Dandelyan in London. “It’s a testament to both their belief in offering guests the best experience regardless of whether they are drinking alcohol or not and a measure of society being at the beginning of a paradigm shift in how it drinks,” Branson said. My verdict: At a time when health is at the forefront of many minds, Seedlip is filling a necessary gap in the cocktail market by catering to a group that was previously an afterthought. The “spirit” certainly makes for a great cocktail, but the fact that this nonalcoholic beverage was made with the same care as a craft gin is the best part.